Butter a 11-inch-by-17-inch cake pan. Place a piece of parchment in the pan and spread it flat to coat the paper with butter. Invert the paper so it’s buttered on the cake side, and line the pan with the buttered side up. Beat the eggs, sugar, and a pinch of salt until the eggs increase in volume two and a half times. Once you’re sure the flour is incorporated, pour the batter carefully into the cake pan, and tilt the pan to get the batter to the corners, rather than spreading with a spatula. The spatula will only flatten all the air bubbles you made by beating the eggs and sugar, and those bubbles are what gives the cake its lift. Bake the cake in a 350-degree oven for 18 minutes until golden. When you touch your finger to the top of the cake, it should spring back without leaving an impression of your finger. If it doesn’t spring back, return the cake to the oven for a few more minutes. While the cake bakes, slice the strawberries. Add the honey and the orange marmalade if you wish, and stir. Let the berries sit for 30 minutes. Take the cake out of the oven and run a knife around the edge of the cake pan. Lift a corner of the cake and grab hold of the paper. Hold the other end of the cake pan and pull the cake onto the counter. Spread orange marmalade evenly and lightly over the entire surface of the cake. With the short end of the cake in front of you, grab the paper under the top of the cake, then tug and fold an inch of the cake over the top of the cake. Then, pulling on the paper, roll the cake into what you’d recognize as a jelly roll. Re-wrap in the paper and set on a cake rack to cool. Take a deep breath and open the red wine. Sample if necessary, just to see if it’s drinkable. Five minutes before serving, add the wine to the strawberries and juice. Whip the cream into soft peaks. Add sugar to the cream as desired, or sprinkle that same amount of sugar over the top of the cream once it has been dolloped onto the strawberries. To prepare the dish, slice an inch-thick piece of cake and set it in a flat soup bowl. 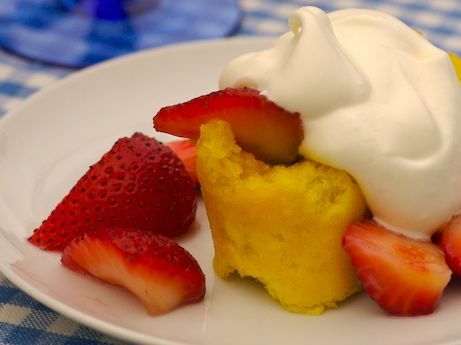 Spoon a generous amount of strawberries and juice (there is no point in having leftovers) around and over the cake, and top it all off with whipped cream.